Here is the first Putz house of the 12 Houses for Christmas Challenge. 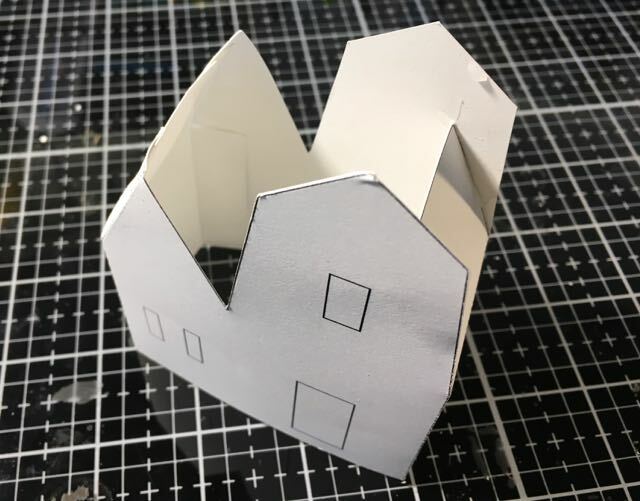 This glitter house is based on a 1930s house from a set of 8 little houses which sold for $1.49 in the 1934 Sears Roebuck catalog. 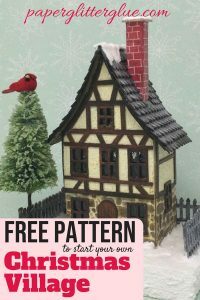 I’ve made patterns from several of the other houses in this set which I will post in the next 12 days. 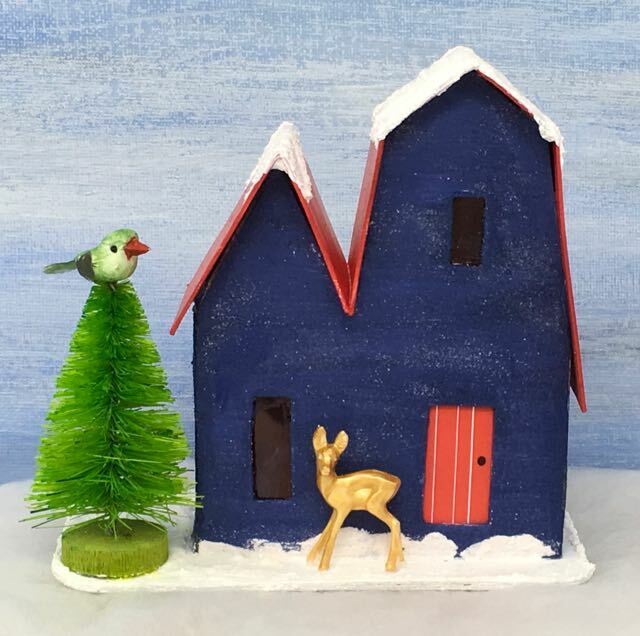 So let’s get starting on the first little Christmas house in our 12 day series of houses. 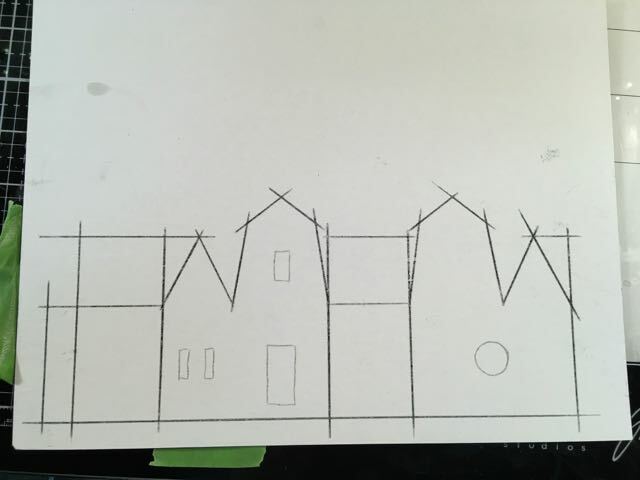 The pattern itself is pretty simple – it is a double gable house with one gable shaped kind of like a barn. 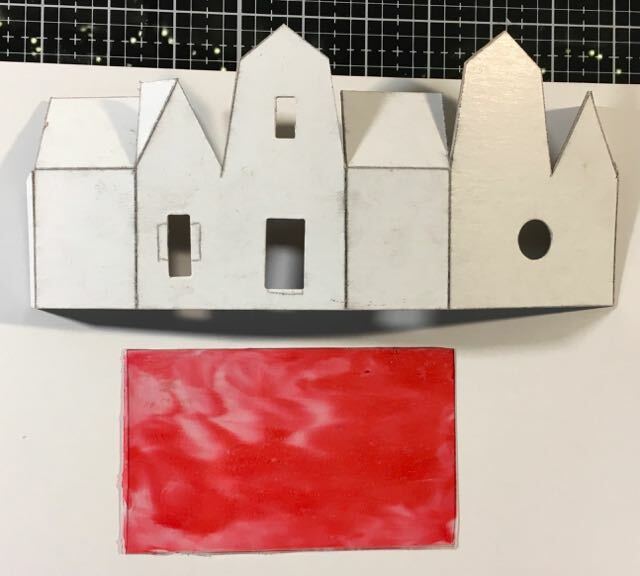 You may shrink or enlarge your pattern to whatever size you want depending on your sources of paper and size of cardboard. Because the vintage house this pattern is based on was painted a blue-purple color, I used the Chipped Sapphire shade from the Tim Holtz Distress paint line. I also sprinkled a little fine sand from the craft store on the wet paint just to give a little subtle sparkle to the house without being too glittery. The roof is painted with a wonderful red Distress Paint called Candied Apple. When you paint the roof be sure to paint about 1/4 inch around the underside because it will show when the roof is glued on. To make these houses easier to make I did not include many windows. Also the vintage versions really didn’t have many windows either. I cut them out of the cardboard with these inexpensive dies I’ve talked about before. You can cut them by hand pretty easily. For the sake of simplicity I didn’t add any windows on the sides either. There is a small circular opening in the back for lighting. Now is the time to add the windows and the door to the inside of the house. I use leftover acetate packaging colored with alcohol inks for the windows. I drew a simple door on my computer and printed it out. But if you want the real vintage look, there are 3 places you can get reproductions of the doors and windows used on the old Putz houses. Pete Oehmen has a printing business and has printed reproduction Putz windows and doors for many years. 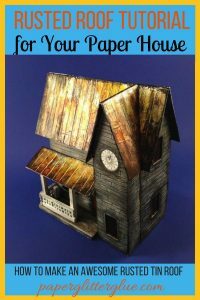 You can find how to contact him and buy the windows and doors on his website – Cardboard Putz Houses. Clinton Hoffman who has the Nutz for Putz Facebook page also sells reproduction Putz windows and doors. 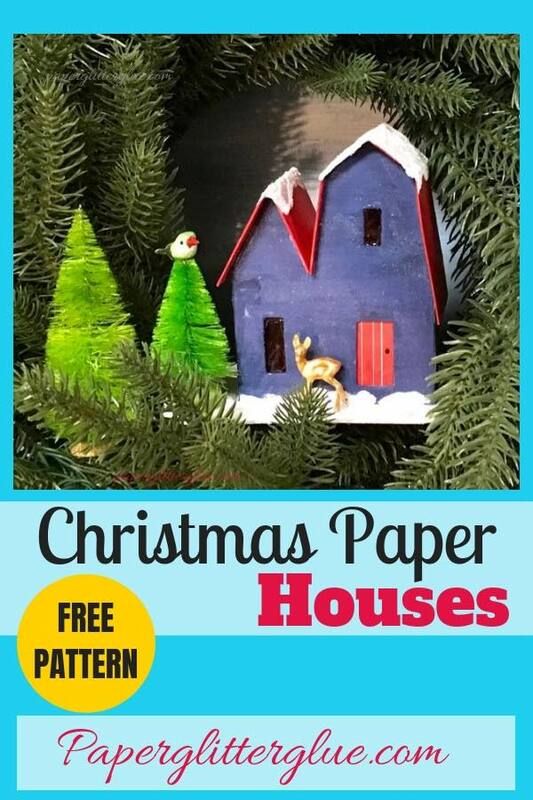 And finally you can print your own windows and doors for free from this link on the Cardboard Christmas Printed Paper Resources page. 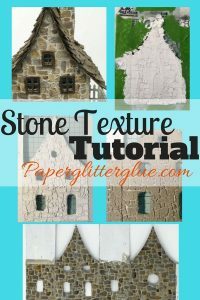 Structurally, this is a pretty simple house so just glue it along the glue tab on the side. Then glue the roof flaps and tabs together like you see in the photo below. The single roof flap on the barn-type gable helps keep the gables from flexing when you glue the roof on. The roof flap is glued between the two gables to help them maintain the spacing of the gables. The prototype house showing how the gables fit on the roof. After you have glued the house together, you can now adhere the roof to the house. Gently fold the roof so it mimics the angles of the gables. Sometimes you have to trim the inside leg of the roof to fit in the V where the two gables meet. It’s hard to make the pattern perfect because the thickness of materials varies. Sometimes you have thick cardboard and sometimes it’s skinnier cardboard. On the photo above, the left gable needs to be trimmed just a tiny bit. Then run a bead of glue along the gable edges. Hold or tape the roof in place until it is set. I often use a painter’s tape to hold house parts together if I can’t use a binder clip. 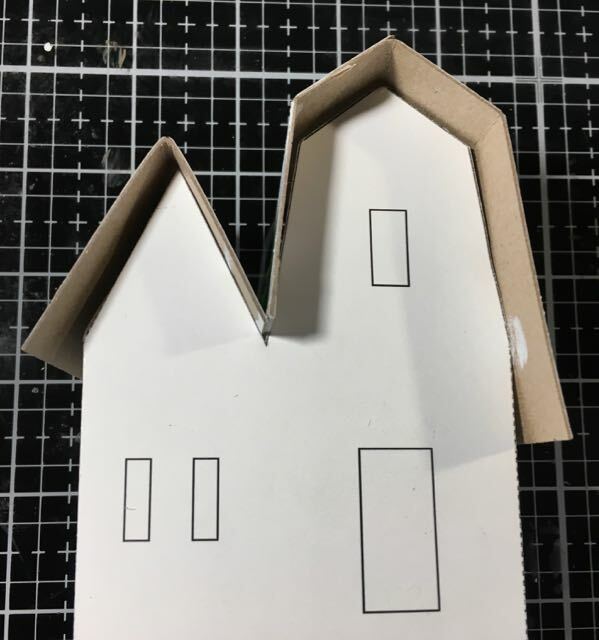 Again, this is a simple house with a simple base so all you need to do is cut a rectangular piece of cardboard a little larger than the house itself. If you want elaborate landscaping or lots of Christmas embellishments, then cut a bigger base. 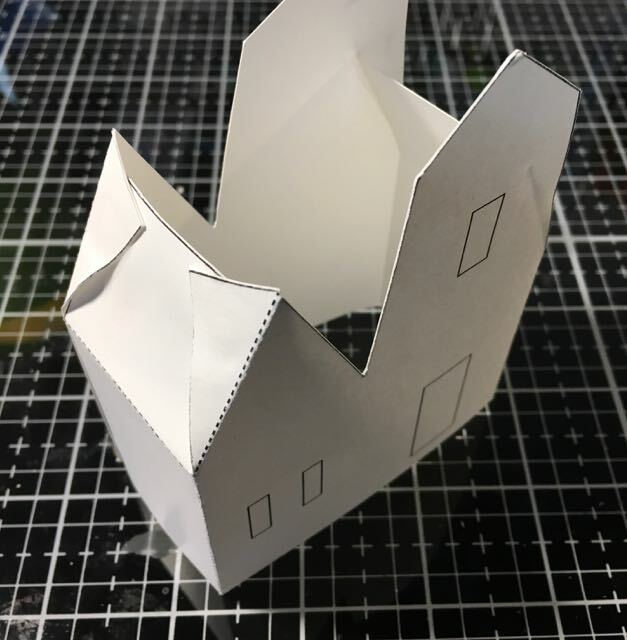 Since I’m keeping these little paper houses pretty simple, I’ve been making the bases small. But please remember to cut a hole in the base if you want to make it easier to add light. If you are putting your house on a wreath it helps to have different options for lighting – in the back or underneath the house. I forgot to do that on this house. For these houses, mostly I am going to paint the bases white and then cover them with snow. Now you get to use your imagination and decorate the little house however you want. I just added a bottlebrush tree with a little bird on top and a Tim Holtz deer. Also I decorated the roof with Snow-tex sprinkled with just a bit of Rock Candy dry glitter. 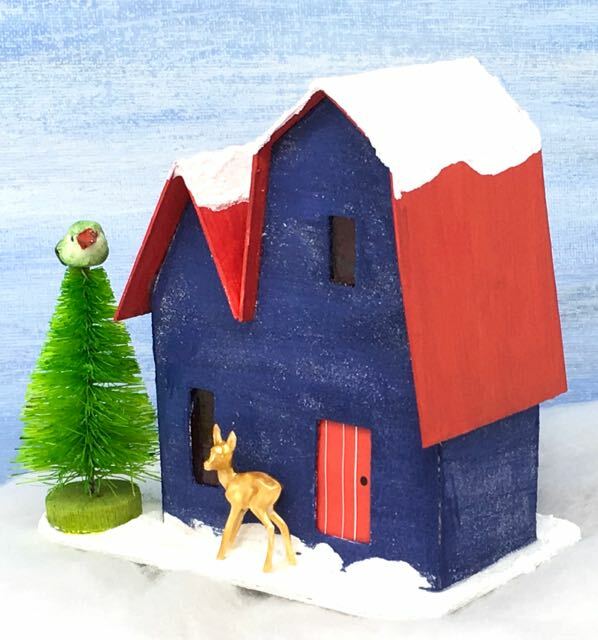 Front view of the little Christmas Putz House No. 1. Tomorrow’s house is a little Log Cabin for day no. 2 in the 12 Houses for Christmas series. 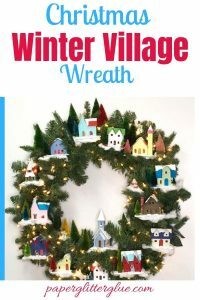 I think it is a great addition to any Christmas village. I hope you will stop by tomorrow.